Apple’s latest product launch (new OSX, iPads, Macs and iWork/iLife) came with a change in pricing for software. OS X and iWork and iLife and updates are now made available free on new Macs and, in the case of the suites, on iOS devices as well. Recall also that iOS updates are now free as well and that OS X had been reduced in price from about $129 to $29 with Snow Leopard in August 2009 and to $19 with Mountain Lion in July 2012. The iSuites have also dropped in price over time so the pattern of evaporating software prices is long-running. 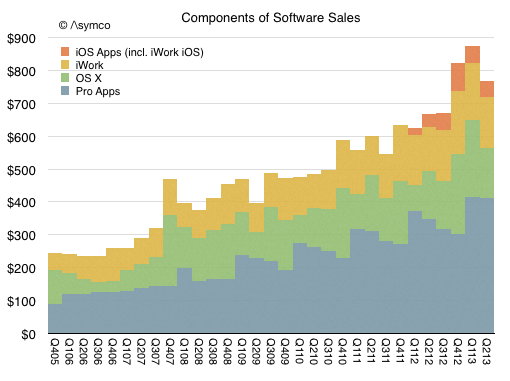 Given that and additional assumptions can lead to the following picture of the components of Apple’s Software sales (in $ million/quarter). The foregone revenues could be as much as $450 million from what would have been received with existing pricing model. So the question that naturally arises is whether this is “worth it”. 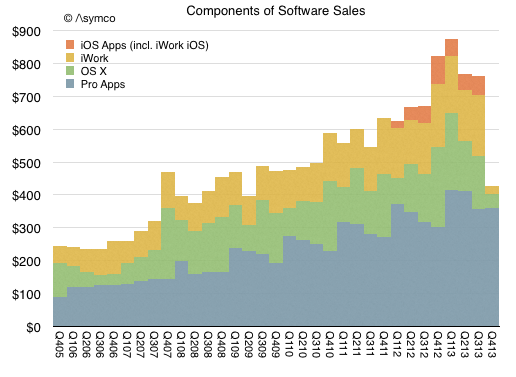 Whether by offering free software hardware or service revenues rise. 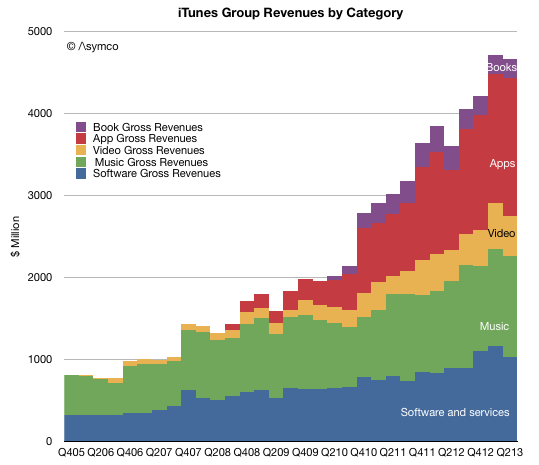 Fundamentally Apple remains a systems company where software is a key element in its definition of value. That is not changing. What is changing instead is the bundling of application software with the systems software and the system itself. The presence of iWork and hassle-free updating of that suite (and the same for the OS) means that utilization rates will increase. I believe the logic for Apple is that usage of the products determines their value and therefore placing powerful software in the hands of more users means they will value the entire system more. This leads to the notion of greater “stickiness” or “lock-in” but also to higher satisfaction and loyalty, rate of upgrades and even more third party purchases and yet more usage. This is the virtuous cycle platform custodians seek to engender. This is what Apple is trying to build and the transition of apps into the system bundle is part of this re-enforcement. One wonders how long before Apple’s approach becomes the norm for other platforms. 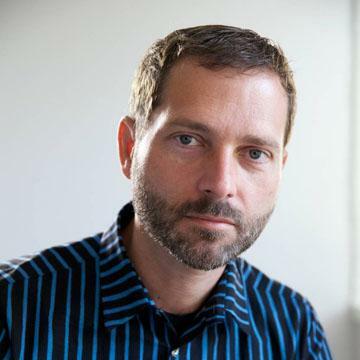 ‹ Previous Post How many mobile platforms can a market sustain?